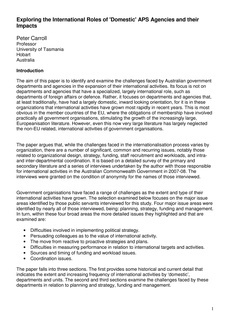 The aim of this paper is to identify and examine the challenges faced by Australian government departments and agencies in the expansion of their international activities. Its focus is not on departments and agencies that have a specialized, largely international role, such as departments of foreign affairs or defence. Rather, it focuses on departments and agencies that, at least traditionally, have had a largely domestic, inward looking orientation, for it is in these organizations that international activities have grown most rapidly in recent years. This is most obvious in the member countries of the EU, where the obligations of membership have involved practically all government organisations, stimulating the growth of the increasingly large, Europeanisation literature. However, even this now very large literature has largely neglected the non-EU related, international activities of government organisations.